Which Park to start with? Ahh…warm weather. 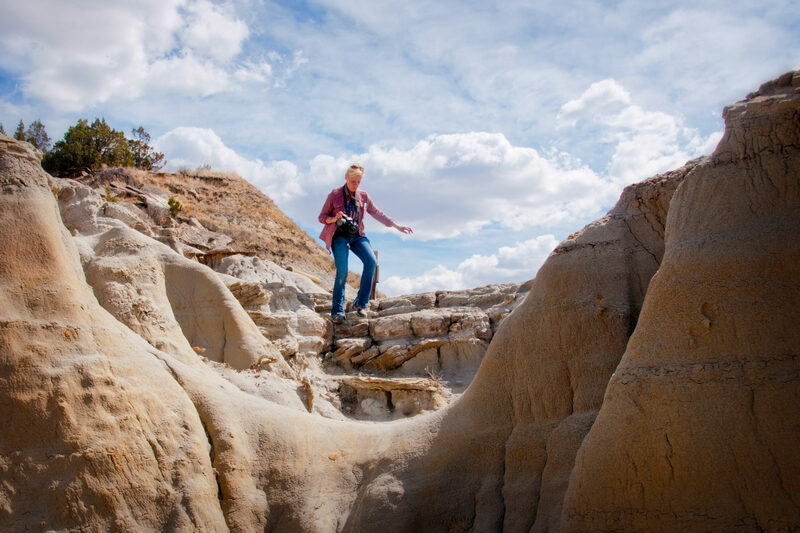 It makes us excited to get into the Badlands and the Theodore Roosevelt National Park. Plan a hike. Which of the two units are you planning on exploring? This can help you decide. We love taking visitors, even young children to the Theodore Roosevelt National Park (TRNP). In classic North Dakota style, the TRNP under-promises, and over-delivers. You’ll be amazed when you put on your hiking shoes and explore either of the two units of the National Park. The idea for the park was evolutionary. It started to be just an idea for a memorial to President Theodore Roosevelt in about 1919 shortly after he died. Eventually, in addition to a connection with a president, the land was recognized for its diverse cultural and natural resources. On November 10, 1978, the area was given national park status when President Carter signed the bill that changed the memorial park to Theodore Roosevelt National Park. Pay the entrance fee and take a bicycle ride into the South Unit of the Theodore Roosevelt National Park. It’s not a place to do off-road bicycling. That’s what the Maah Daah Hey is for. But if you stay on the road, and carry plenty of water, you can enjoy a pleasant pedal. The south unit attracts many families since it is easy to get to, right off I-94 at Medora. The south unit is much larger than the north unit and more people will be there when you visit. Who needs a plastic playground when you have a National Park to explore? People especially like the scenic loop through the park; a pleasant drive that shows off eye-popping vistas. The terrain is accessible to all levels of explorers. There are both very easy trails, and very challenging trails to follow. Or you can check out a deer trail on your own if you are skilled enough to find your way back. It’s easy to get turned around in the hills. We make two recommendations for those who want to hike the park. Easy is Ridgeline Trail, challenging is Scoria Point. Just below the horizon on the left is a ridge connecting hilltops. The ridge may continue, but you won’t know unless you get out as far as you can get. Just about even with the horizon on the right is a ridgeline we plan to follow. Below it, the grassy ridge is the one we followed that promised to open up to good views. We recommend for those who want a quick upward hike with the reward of stunning views, try Ridgeline Trail. It’s an “up and back” trial, not a loop. You can park near the trailhead and walk up the steps carved in the hillside, then explore the top of the hill. Near Scoria point, this red rugged burned clay hill (scoria) showed off its colors and ruggedness. If you are up for a real challenge, take one of the deer trails that pass by Scoria Point. You’ll immediately go down a valley, and then within a mile head back up to a hilltop for a bountiful sight of hills that seem to go on for an eternity. The south unit is also home to the famous wild horses. Some claim they are Nokota horses. Others note they have too broad of a DNA to be limited to one breed. Prairie Dogs are all over the South Unit. They’ve taken over many lowland areas. People love to stop at the prairie dog towns and watch the critters skitter and scamper about. Ranchers and farmers consider them a pest since they wipe out vegetation, harbor diseases and create unstable ground with their tunnels. On the other end of the animal-size scale are the bison and the elk. Elk is a little more rare to spot. We’ve been as close as a few yards when they ran past us, unaware that we were nearby. Of course, the stars of the south unit, much like those of the north unit are bison. It’s easy to imagine there are photos around the world of these stars of the park. The larger herd is in the south unit, the north unit has them also. Since the north unit is more “compact,” or “intimate” the odds of seeing bison in the north unit are greater. About 75 miles north, along the Little Missouri River is the newer of the two units (newer by an eon or two.) The north unit is on the very southern edge of McKenzie County and is one of those features that makes McKenzie County a world-class destination. It’s a rugged wilderness with a variety of trails through the park to suit all types of hikers. That’s why, when we visit the park, we don’t stay in the car, we get out of the car and into nature. When my three kids were in their energetic elementary and preschool days, they could be loose, free and safe to run, explore and challenge one another. The North Unit is eons younger than its twin in the southern part of the state. It is more rugged and challenging. Because it is more remote, it also has less tourist traffic than the South Unit. Our personal favorite is to hike all or part of the Achenbach Trial. It is 18 miles long and you can extend it into a two-day hike. If you intend to camp in the backcountry must obtain a free backcountry permit prior to their trip. Permits are issued at the South Unit and North Unit visitor centers. The full trail provides steep climbs and descents and two river crossings await you on a trail that leads deep into the heart of the Theodore Roosevelt Wilderness. It’s tough to do in one day, so we recommend just taking the west end of the trail down the hill from the Oxbow overlook. The map will show where to get on and off. Like the south unit, bison are the stars of the park. Unlike the south unit, the herd of longhorn cattle is a reminder of the wild west days of cattle drives and cowboys. Its how the Long X came to be associated with McKenzie County, Watford City and the north unit of the Theodore Roosevelt National Park. If you are prepared for a longer hike, the Buckhorn Trail will take you through a prairie dog town. Our favorite moderately challenging trail is the Achenbach. It’s actually a two-day hike, but you can hike just the west portion of the Achenbach. We did. We parked our Jeep near the bottom of the hill and hiked up over a ridge to the south to intersect with the trail. Once on the trail, we headed westerly. It’s an upward grade, but we were fresh, so it was an easy hike up. At one of the highest points on the Achenbach Trail, near the western terminus, a look back at where the trail started. We’ve encountered dozens of people who prefer to just drive through the park, turn around and drive home. What a waste! Even motorcyclists who buzz into the park, around the sweeping curves, will get off their bikes and walk across a ridge above the Little Missouri River. If you’re tempted to just drive the park, we encourage you to consider at least a stroll through the terrain; get a map at the visitor center and see what easy and accessible points there are for you to enjoy. If you’re up for more of an exploration, the map will show the trails you may want to follow. There are three easy trails, each shorter than one mile and can be hiked in less than a half hour. There is one more element to the Theodore Roosevelt National Park system that’s between the north and south units. The Elkhorn Ranch site is rarely visited, so if you choose to seek solitude and history, consider heading up the gravel roads to the home of Theodore Roosevelt. The face of the hill across the river from TR’s ranch house veranda. He often wrote about this scene. 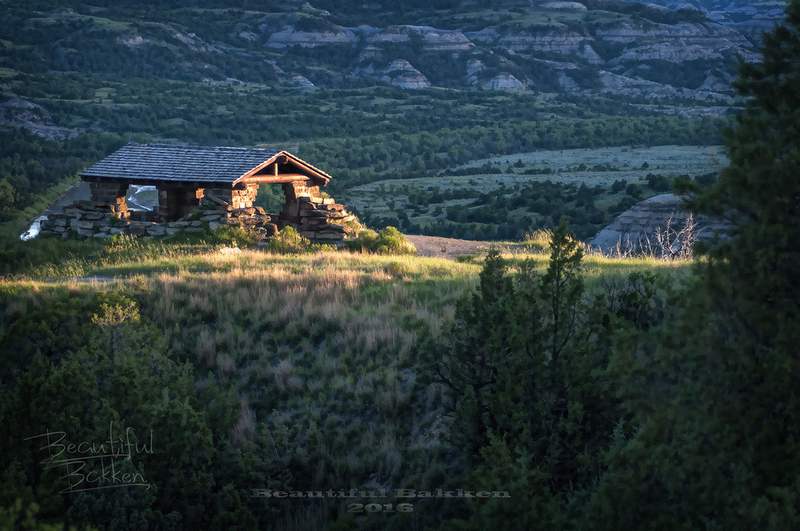 We’re delighted to answer questions that people have about the Theodore Roosevelt National Park. If we don’t know the answer (and often we do not) we can connect you with the person who will have your answer. We love to speak to groups about how and why to visit the Theodore Roosevelt National Park. Just contact us and we will work with you on a customized presentation for your group. A Park Guide is a handy thing to take with. You can get it online or at the visitor center. As spring and summer progress, we’ll be in the Badlands and the National Park often. Subscribe (box in the upper right) to watch the landscape come alive. You’ll get a note in your inbox when an updated view is posted as a blog here on Beautiful Badlands ND. Oh, I almost forgot. 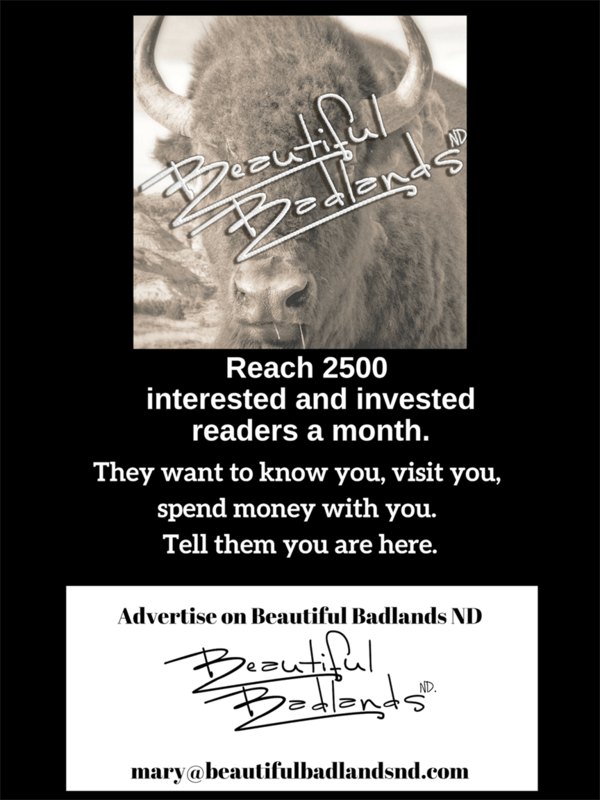 If you subscribe, you’ll get for free, a twice-a-month newsletter from the Beautiful Badlands. You can follow us on Facebook where we share many excellent sites, scenes, activities, and events from the Badlands of North Dakota.